Continuing Singapore’s ardour for made-in-Japan brands and talent, bartender Daiki Kanetaka pens a love letter to tipple sippers here with his handsome new Ginza-style bar that delivers a rarified cocktail experience to swoon over. D.Bespoke – the ‘D’ is a reference to Kanetaka’s first name, but it comes across as pseudo-French – is almost like a reprise of the exclusive Glen and Glen Classic bars in Beijing for which Kanetaka’s exalted (he’s opening another one in Jakarta soon). Singapore is his new home; he says he’s here to stay, and will only visit his Beijing bars a few days each month to keep tabs on things. 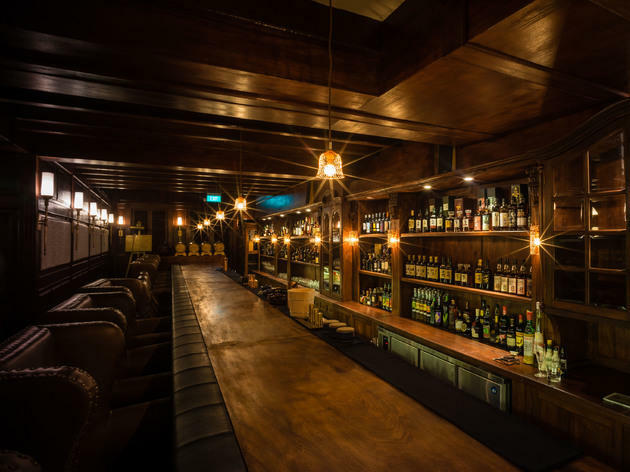 Enter the 28-seater shophouse speakeasy from a lifestyle retail front selling some of the bar’s glassware, leather products and, oddly, a fixie. 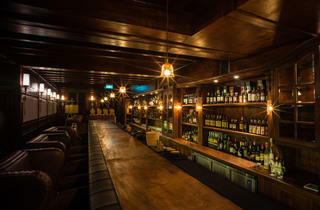 Inside, Kanetaka replicates the wood-clad long bars of his other establishments, with 14 bar-side bearish leather armchairs and seats for another 14 on plump chesterfield loungers. The mid- and top-shelf liquors are tastefully spaced out and never stacked two deep on a bar shelf that spans the wall, and at the far end perches a stretched leg of Jamon Iberico de Bellota ($40), shaved in glossy strips to order. This is by no means an everyday bar. With 16 years’ experience in the strict Japanese bar system, Kanetaka counts Japanese legend Hidetsugu Ueno a mentor. He’s devoted two years – including a four month stay in Jerez – to get his sherry sommelier-like venenciador certification, and has spent time at the Ardbeg and Glenfiddich distilleries in Scotland. The man’s also somewhat of a jazz junkie, playing dapper DJ with his small library of jazz CDs and vinyls. Once we’re helped into the lounge seats, D.Bespoke’s bartending theatre reaches its second act. One of the many apprentices hands you a hot towel and places three coasters before you: one for a shot of sencha to cleanse the palate, one for a glass of water, and another for the handmade Japanese glassware holding your cocktail. A copper disc is also placed in front of you, which holds dried fruit and almonds. It’s somewhat unnerving to flip through the thick, unbound stack of papers that comprise the menu. There are no prices, and given the white-gloved treatment here, you might also be too afraid to ask. But do it anyway. Prices are on the high end, and D.Bespoke has a minimum order policy of $60 per person. Customised cocktails start at $27 – as do neat spirits – for a lean pour that stretches out over very wide or very narrow glasses. The tasting flights of the wide range of sherry and armagnac on offer, in contrast, are surprisingly better value for money (from $25/ three to five tasters). The hierarchical sensei-senpai dynamic of the Japanese F&B industry is very evident here – only Kanetaka mixes the drinks. Once ready, the cocktail is brought with spirit bottles and other apparatus for the final stir or shake in front of you. Our custom pours of Talisker with Tio Pepe Oloroso sherry, and Yamazaki 12 with dry and sweet vermouths are perfectly balanced, and an absolute treat to savour. Kanetaka ultimately wants his bar to be a sanctuary for quiet and meaningful conversations over great drinks, so look elsewhere if you’re already in the ‘Woo!’ state of inebriation. The final bill is discreetly presented to you on a name card. It won’t be cheap, yet it’ll feel every bit worth the coin. It all means you’ll leave D.Bespoke a little shell-shocked. Because only when you step outside and feel the humidity lick your skin will it dawn upon you that despite the calibre of the drinks, décor and service, you aren’t in Tokyo. But with a temple to bartending like this around, maybe that ain’t so bad after all.